with new updates and a new name! 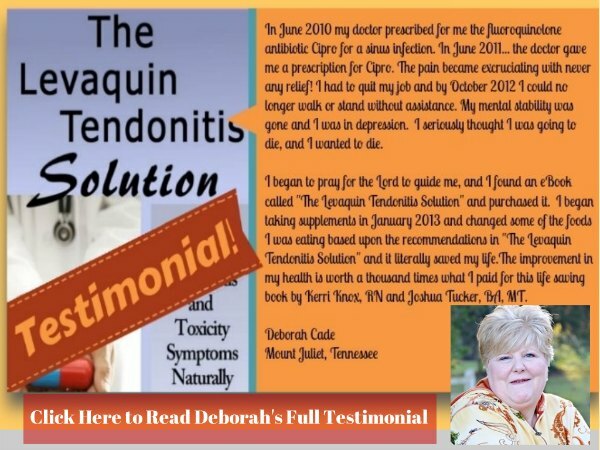 The Fluoroquinolone Toxicity Solution is absolutely your best option for healing from the damage, pain, and ongoing toxic symptoms from taking Levaquin or other Fluoroquinolone Antibiotics that do so much damage to so many. If you are reading this, then your doctor obviously hasn't helped you, but you need a solution to the damage you've sustained from these antibiotics, you still need to heal don't you? Well, you've just found the solution! 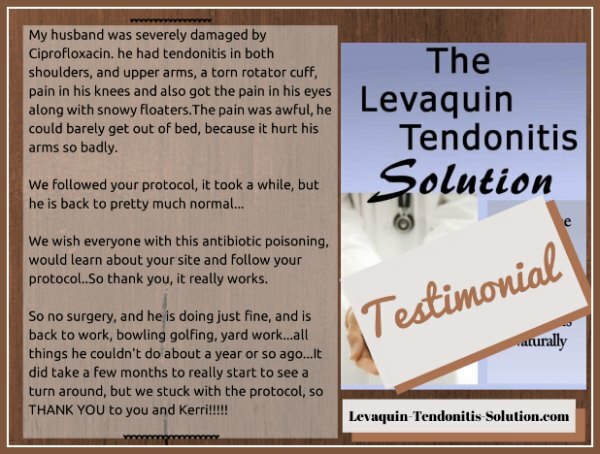 These are just some of the side effects that you are experiencing from taking Levaquin, Cipro, Avelox,Floxin and any of the other Fluoroquinolone and Quinolone family of antibiotics that the pharmaceutical/medical industry prescribes by the tens of thousands every day without regard to the damage that they cause. Are you afraid that you are never going to heal? Are you afraid that you are going to get MORE injured from the Quinolone poisoning? Speaking bluntly...your fears are well founded. People have hurt for YEARS, and their pain has become worse down the road. The pharmaceutical companies that create and profit from the sale of these antibiotics and the doctors that prescribe them have no incentive to investigate a cure- or to even prevent these problems. But that doesn't mean that there are no answers- there absolutely are, they are just not going to come from the same people that poisoned you in the first place. Like any problem, you have to find out WHY the problem exists. Until you do that, you can't figure out HOW to fix or diminish the problem. There is hope for you because there is enough information out there from various arenas of research to show you WHY you were damaged. And only when you know why you were damaged can you begin to reverse that damage. 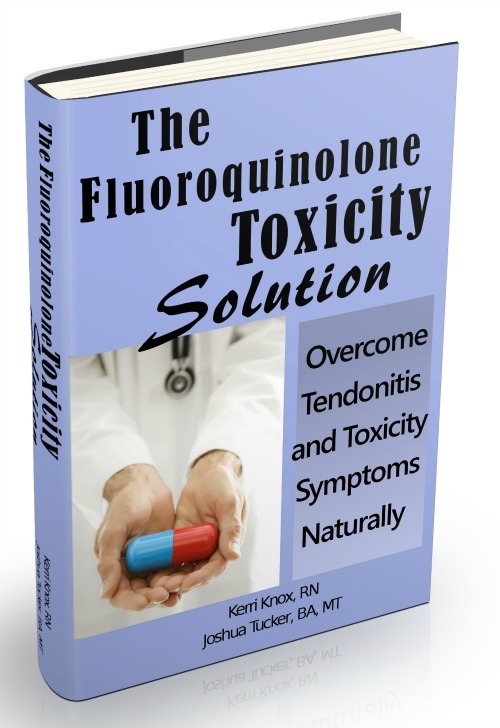 The Fluoroquinolone Toxicity Solution ebook tells you WHY you were damaged when so many others weren't, WHY you hurt, and why you CONTINUE to hurt more and more. But just as important or even more so, the Fluoroquinolone Toxicity Solution gives you a step-by-step protocol on how to repair and reverse the damage that you sustained. It's an instantly downloadable HOW-TO book on reversing the pain and damage that you've experienced and HOW-TO start getting your body to heal. It's not about hope, or believing that you can get better, it's about HOW the body works and HOW to help it heal. 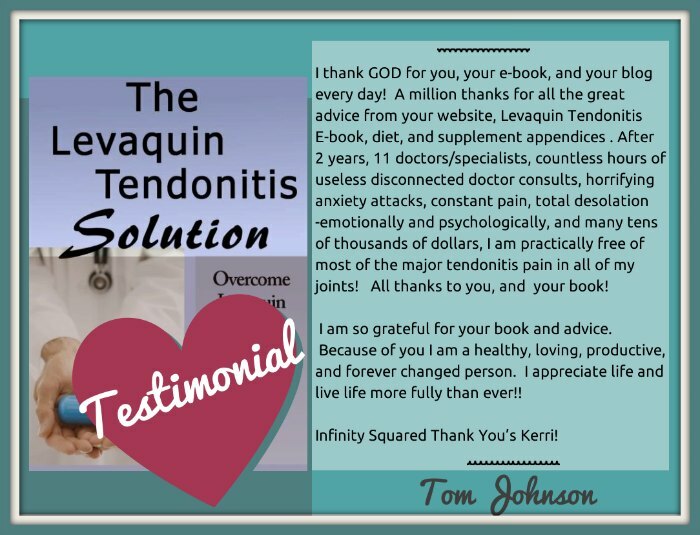 YOUR AUTHORS Kerri Knox is an ER/ICU nurse with 15 years of experience. She is also a Functional Medicine Practitioner, helping people suffering from chronic illness and chronic pain issues to find relief and become healthy again. 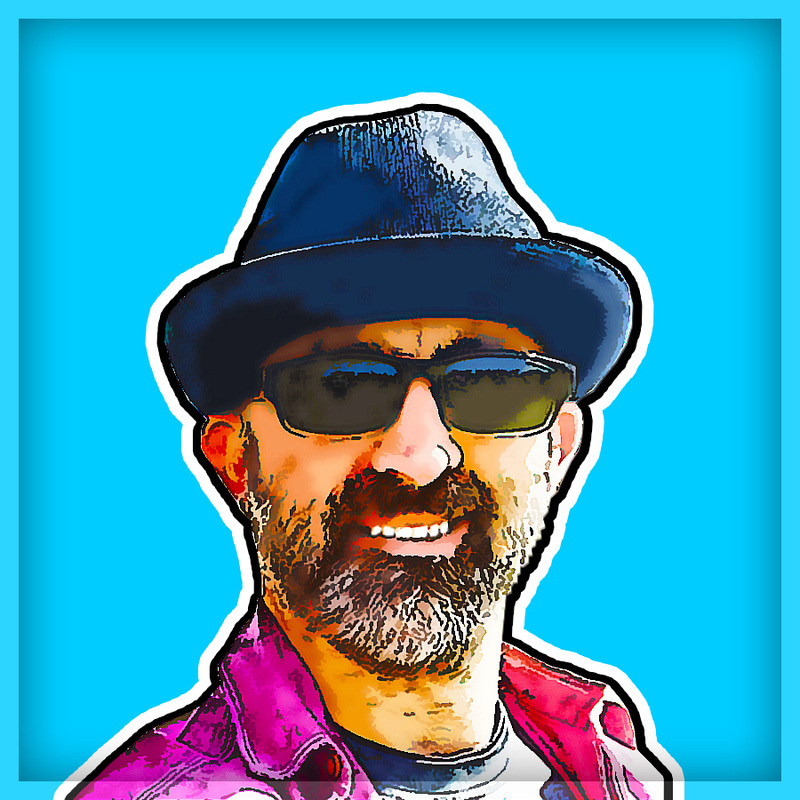 Joshua Tucker has 12 years as a Massage Therapist specializing in the eradication of Tendonitis pain and problems. He uses cutting edge technology and equipment that most massage therapists have never even heard of. The Fluoroquinolone Toxicity Solution is based on years of painstaking research. Not only from reading the peer-reviewed studies, but research working with actual Fluoroquinolone Toxicity sufferers one-on-one and finding out what works (and what doesn't). You could go to any of the many forums out there and get piecemeal advice on hundreds of different things that you could try, but will they work for you? We've ended the confusion by bringing you what is going to be the most likely to work for you, because it's been the most likely to work for the most people that we've worked with. Additionally, we measured individualized metabolic testing of those that we worked with using state of the art laboratory testing that your doctor likely doesn't even know about. What we found was remarkable. Almost everyone who was poisoned by the Fluoroquinolones had virtually the same metabolic markers on these tests! And since these tests are based on specific metabolic and nutritional needs, we could see exactly, right there in black and white what route needed to be done to get people better. Even better, following the outline from the metabolic testing not only worked in theory, but in practice! In other words, people got better. 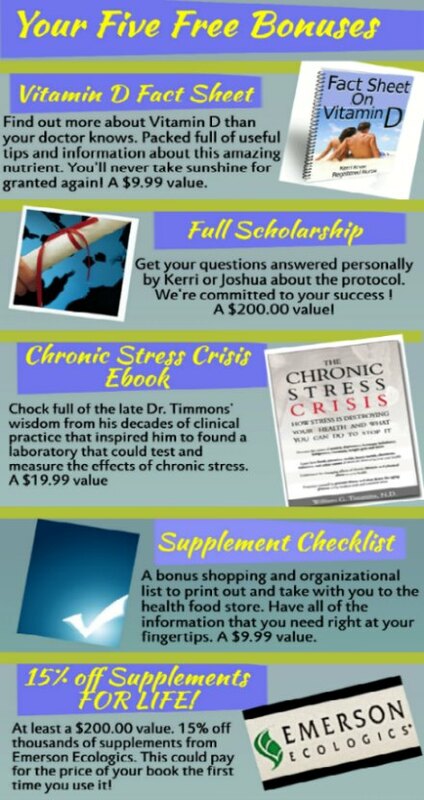 After working with dozens upon dozens of people who spent over $500 each on these metabolic tests that came back virtually identical, we made the decision to put our solution into a protocol so that we could help more people, and to save them hundreds of dollars on expensive individualized testing by distilling these results into a step-by-step protocol that everyone could do without the expensive testing and one-on-one consultations. You get all of the benefit of our experience at a fraction of the cost. There are no better options out there for you. There are pills and 'therapy', but as thousands of people like you report, they don't work. Does your doctor have a cure? Or even anything that helps? Does your doctor think your symptoms are just in your head? The medical model focuses on symptoms. YOU need to focus on the CAUSE. And few of the piecemeal solutions on the many forums out there are going to address the actual causes of the problem. 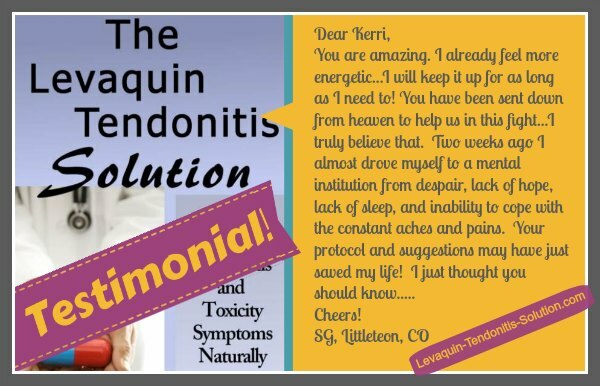 The Fluoroquinolone Toxicity Solution does just that! Together we look at the cause of your pain and other symptoms and show you how to correct the negative factors that are conspiring to keep you hurting and disabled. Page 24: If You Only Do ONE Thing, Do This! Page 33: Is Your Muscle Pain From The Antibiotics? You took Fluoroquinolone antibiotics, now you have long lasting pain. But the fluoroquinolones are (theoretically) out of your system after just 3 days. So why do you still hurt? Is it the antibiotics? Or did the antibiotics set off a chain reaction of problems that now have you STUCK in a pain dynamic? It may not actually be the antibiotics that are causing your pain. Actually Preventing You From Healing? Did you know that many pharmaceutical drugs, like the ones you may be taking to 'manage' your pain, may actually be preventing your body from healing effectively? ✔ Why most lab testing is virtually useless and which one is WORSE than useless! You haven't tried this. Everyone believes that they've 'tried everything', but you can't have tried what you don't know about. And even if you have really tried everything, you probably did not try them in the right combination to make those things work synergistically so that they were actually able to fix the underlying metabolic issues. Again, there's nothing else out there other than more drugs (that make your body less able to fight off the damage). We offer a complete step-by-step plan that will strengthen your body's healing system and allow you the best chance to fight off this ongoing damage. It's not your fault that you have been poisoned by Fluoroquinolones. You trusted the medical system that ordered your prescription. Your doctor got you into this extreme pain/problem, but he doesn't have anything to get you out of it. 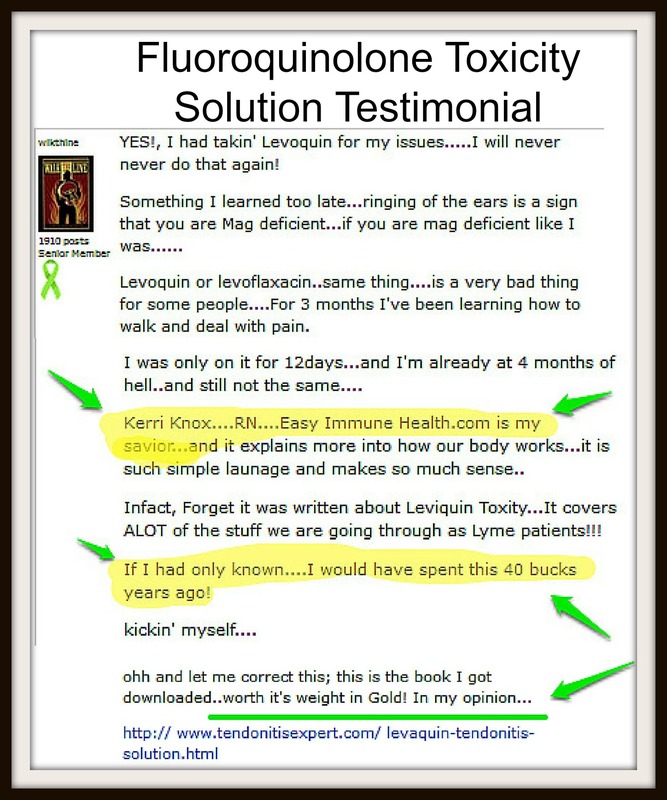 So you want to know if The Fluoroquinolone Toxicity Solution can help someone with extreme pain or toxicity symptoms. The answer is, yes, it can. Having said that, the worse your pain is, the more damage your tendons and other structures have taken, the more diligence it's going to require on your part. If you are looking for the magic pill, the quick fix that will allow you to take a few pills for a couple of weeks and be all better, you've come to the wrong place. This will take time, patience, and effort. You're looking at 1-6 months before evaluating to see if it's working.There's a lot happening in your body that needs to be remedied. The worse your damage is, the more time you need to give your body to recover once it is -actually- healing. While it may SEEM like you got into this mess and got damaged overnight, the metabolic testing tells me otherwise. Your damage is based on a lifetime of habits that were not right for your specific metabolic needs. 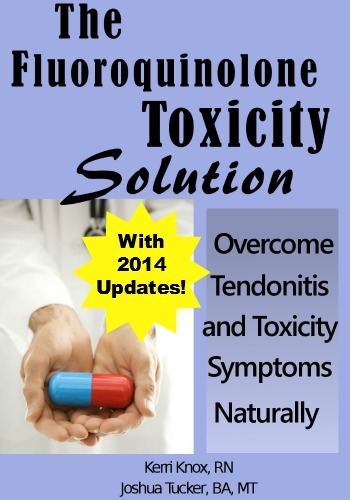 The Fluoroquinolone Toxicity Solution is an Ebook jam-packed with over 130 pages full of tried and tested research-backed investigation and a step-by-step PLAN to get you well again! Remember it's not about treating your symptoms, it's about making your body HEALTHY again. With your purchase you not only receive the instant ebook download, but you also receive a FULL SCHOLARSHIP to the Fluoroquinolone Treatment Support Forum! 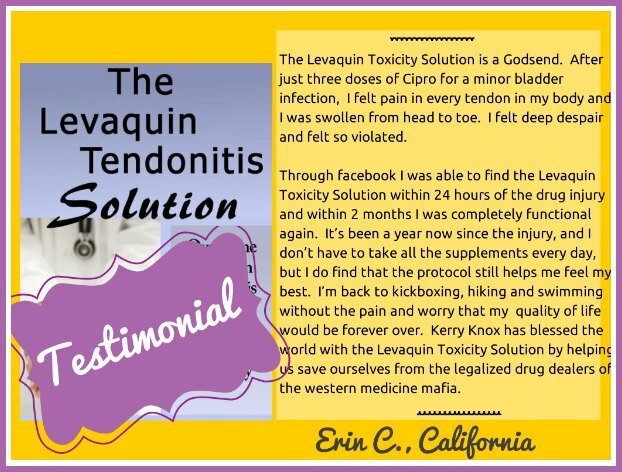 In the LTS Forum you not only get to trade experience and stories with other people committed to healing themselves and getting their lives back, people like you that are suffering from Fluoroquinolone poisoning, people that are using the Fluoroquinolone Toxicity Solution, you also get personal feedback from the author Kerri Knox, RN, FMP and contributing author Joshua Tucker, BA, CMT. You won't get THAT with any other book! The Ebook normally sells for $69.99, but right now, it's just $39.99 for The Fluoroquinolone Toxicity Solution. 15% off Professional Supplements for LIFE - at least a $200.00 value or even more over your lifetime! Kerri are I are Committed to helping you get better, so we have provided the FULL PRIORITY FORUM ACCESS as our contribution to helping right the wrong that the Fluoroquinolone antibiotics have caused in so many peoples lives. and get started healing right now! *This is an Ebook that you download and print, or read on your computer. Are You Ready To Start Getting Better?